You got TRANSFORMERS in my Angry Birds! No, you got Angry Birds in my TRANSFORMERS! ERGH, OOF, MPPHH!!! Hey! Waitaminit! This is actually pretty great! Thats right, comic lovers, two of your favorite IDW comics have morphed into one amazing new comic! 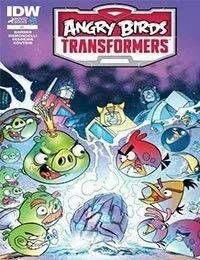 When the TRANSFORMERS lose their powerful ALLSPARK, it ends up on Piggie Island and the world of Angry Birds turns robotic! Prepare to meet... the AUTOBIRDS and DECEPTIHOGS!